David Bowie's 65th birthday has me watching a lot of his videos and also reminiscing about two occasions when I was in the same room with him and in rather close proximity. For both occasions I was working at MTV, and lucky enough to go to a press conference to announce the lineup for his 50th birthday party concert at Madison Square Garden January 9, 1997. 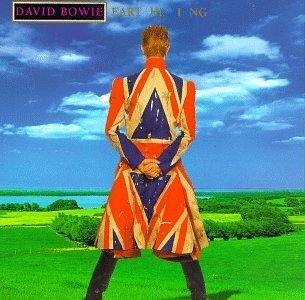 Bowie was also about to release a new album in February called Earthling, and he wore the long, Union Jack printed coat on the cover of the album to the press conference. Not sure how I managed to score a seat in the front for the press conference, but I did, and gazed upward at him, in complete awe. His hair was short, blonde and in a pushed-back style. 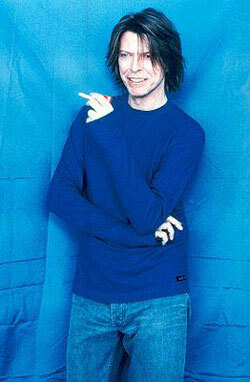 He wasn't particularly tall (famous people rarely are), but he appeared long and lean, and looked incredibly happy. The glow that radiated from his body is not something I'm likely to forget. He grinned from ear to ear, and had a true sparkle in his one blue and one brown eye, which are so much more startling in person. When I'm 50, I want to radiate the energy he did then. The second time I found myself close to Bowie in a room was purely coincidental in September 1999 when I went to cover a press conference to announce the lineup for the three NetAid concerts at the Millennium Hotel, across the street from MTV. I got there ridiculously early to set up, but I was really so early that I had nothing to do, so I just sat in one of the seats towards the back. If my memory serves me, Bowie had been announced as a performer at Wembley in London for the NetAid concerts that October, but I don't remember whether I knew anything about him being in New York for this press conference. I was just sitting there, killing time, when I could just sense a presence behind me. I turned to find him standing directly behind me, and it was only later when the shock wore off that I realized I cowered in reaction to his greatness, much like a servant bows to his king. I think my heart literally leapt out of my chest. His hair was longer, dark, straight, with some layers in his face. Those eyes. I got lucky… twice. 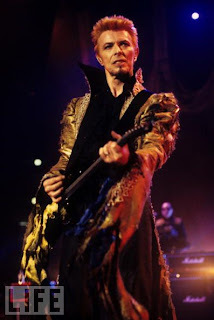 But I've also been blessed to have seen Bowie 3 times in concert, each performance dramatically different from the other. My first boyfriend Steve - a huge fan - got us tickets to see him in New Jersey during his Sound & Vision Tour in 1990. It was a life-changing moment for me, seeing Bowie put on a show. He had recently announced his new band, Tin Machine, and that's part of what made this tour so special: Bowie was not only performing many of his most-loved music, but also threatening to never play his older stuff again. This show was a literal blend of sound and vision. I was mesmerized. Start this one 1:07 in. This is just a great performance of "Fame" with Adrian Belew on guitar. I went to his 50th Birthday MSG show, after that press conference in '97, which included performances with Robert Smith of The Cure, Smashing Pumpkins' Billy Corgan, and my favorite, Foo Fighters. But in another life-changing event, in October of '97, I was able to score a ticket to his intimate set at the Supper Club in NYC, thanks to his publicist. Seeing Bowie perform effortlessly in a small venue ruined me. Ha! It really was amazing. But then again, anything he does is special.